Lake Atlin is the largest natural lake in the region of British Columbia. It is one of the most beautiful views in the territory of Alaska and Canadian federal Yukon Region and one must see it, if going through Canadian territory. Although not located on the Alaska Highway, the inspiring beauty of Atlin led many people to pull off from the main road south of Tagish, at a place called Jakes Corner. 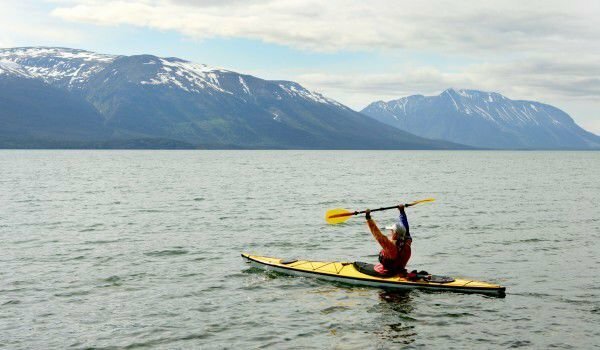 Located 180 km south of Whitehorse and the scenic Yukon River, lake Atlin stands in an amazingly beautiful place surrounded by mountains, which often cause the area to be compared with Switzerland and its Alpine scenery. Atlin’s title complex is located on the east coast of the lake. The northern part of the water pool falls within the Yukon and is known as Little Lake Atlin, but for the most part is included in the arrangement of the region Atlin, which is part of British Columbia. Some say lake Atlin should be considered the beginning of the Yukon River, although it is considered part of the small river of the same name, heading to Tagish Lake. The name of the lake comes from the Indian dialect word "Áa Tlein" and can be translated simply as "large lake", but according to other sources, it could mean "stormy weather". The town Atlin on the east shore of the lake is actually a nice, beautiful and quiet place, nestled in a valley and having access to the clean water of the lake. At the southern end of the pool of water, an island was formed, known as Teresa Island. It claims to be the highest-lying island in the world, in freshwater, located at 1875 meters altitude. Its highest point is at Birch Mountain. The area around the island is the Atlin Provincial Park and Recreation Area. Within this park is also included the Llewellyn Glacier and one of the largest ice fields in North America - Taku Glacier, also known as Juneau Glacier. Here, everywhere you look, your gaze will encompass majestic ice caps, some of which reach a height of 2800 meters. The park is accessible only by boat on Lake Atlin, or by air. Here the summers are warm and pleasant in the winters - cold and frosty. The park gained popularity with the occurrence of the "gold rush" in 1898 in the local lands, which were literally a "gold mine". Today, here can be seen several historical and archaeological sites. The Atlin protected areas include three main sections - Teslin Plateau, the Tagish-Highlands and Boundary Ranges, which are characterized by diverse and valuable flora and fauna. The area of Atlin was turned into a tourist destination in 1900, when the gold rush receded and only the many mines and transport routes remained. Even to this moment here mining is underway. For fishing the lake Atlin is also a "gold mine" because here, against a small fee, you can catch a huge trout.